1. Of or pertaining to a college, academy, school, or other educational institution, especially one for higher education: academic requirements. 2. Pertaining to areas of study that are not primarily vocational or applied, as the humanities or pure mathematics. 3. Theoretical or hypothetical; not practical, realistic, or directly useful: an academic question; an academic discussion of a matter already decided. 4. Learned or scholarly but lacking in worldliness, common sense, or practicality. 5. Conforming to set rules, standards, or traditions; conventional: academic painting. Education is designed to distort perceptions of reality from a very early age - It is the systems primary programming tool and schooling is quite literally a brainwashing operation. 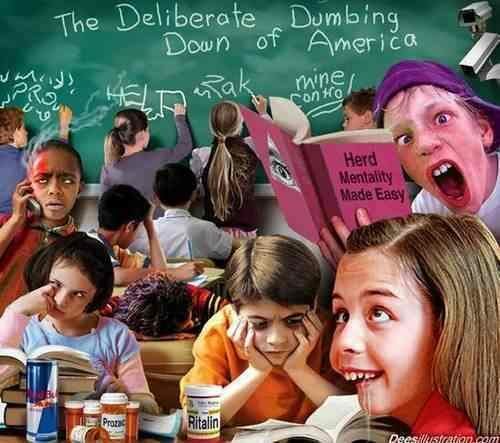 The education system requires children (as young as 4 years old in the UK) to sit in classes for several hours a day absorbing information and having their very perception of the world shaped by a curriculum dictated by government. Education is deliberately controlled to keep us thinking ‘inside the box’. Rules and boundaries are set and so-called 'facts' dictate how, when and why, limiting the possibilities of different interpretation. I think a turning point for me was at age 4 in my first year of school, I can vividly remember the occasion and it must be one of my earliest memories - we were drawing what we had for breakfast and I’d had fried egg on toast that day, but I couldn’t find a pink colouring pencil to colour the egg yolk and when I asked the teacher for one she explained to me that eggs are orange and white and definitely not pink! Well that set the tone for the rest of my education, I’d seen a pink covering over my egg yolk that morning and now I didn’t trust this woman one bit… I also remember being told at school that the world was created by a big bang, although my Sunday school teacher said it was God. I was also told that an ice age wiped out the Dinosaurs but I now know that actually no one can categorically confirm any of them statements to be true and certainly not the God one. But utter garbage like this still gets taught in schools as cold hard facts, the facts may change over time but not inline with the truth. The potential inventors and entrepreneurs of tomorrow are generally left behind by the school education system - if they don't follow the rules, (that is to sit down in a class room and absorb a load of boring crap for 6 hours a day 5 days a week without expressing any character, personality or individual thought), they are seen as disruptive troublemakers who don’t want to learn. Just think about that if your child has been diagnosed with ADHD. The teachers and doctors are telling you there is something wrong with your child, no there isn’t, your child wants to live life and experience it through living, he/she is not a zombie who wants to sit and be told black is white. Most kids I’ve met who apparently have these attention deficit disorders happen to be some of the most creative, intelligent and well-rounded kids, there’s nothing wrong with them, they just hate sitting in classrooms listening to garbage. These kids might not learn anything when someone is simply repeating information to them and expecting them to absorb it and repeat it all at exam time, but they may be better than anyone else at finding out for themselves, IF they were ever given the opportunity. Through the manipulation of intellectual integrity and the rewarding of arrogance the education/indoctrination system is deliberately and effectively able to filter the two extreme types of people (non-conformists/repeaters, or to put it bluntly those who can think for themselves and those who can’t) and therefore dictate different methods of control to keep us all in line. (And arguing amongst ourselves of course). The kids who don’t conform in school often have a better level of genuine intelligence than most of the kids getting good grades because getting good grades only means you can repeat the information the teacher repeated to you without thinking for yourself. However the system wants people who are good at absorbing information and repeating it, conforming to authority and being so ‘well educated’ that they can be taught that black is white. The conformists, the repeaters and the no thinkers are those who fit the bill for the placemen in government, banking, military and of course not forgetting the biggest repeaters of them all, the media. The kids who think for themselves will not necessarily be as good at repeating information, which is often useless anyway, they will not get the best exam grades, wont get the university education therefore will be set for an average job at best, will not earn a decent living and with the way the system is, being so ruthless, many will struggle to survive in the system. From 1999 to 2010, the suicide rate among Americans ages 35 to 64 rose by nearly 30 percent, to 17.6 deaths per 100,000 people, up from 13.7. According to the US Centers for Disease Control and Prevention more people now die of suicide than in car accidents. What does that say about the world we live in? Charlotte Iserbyt was a Senior Policy Advisor in the Office of Educational Research and Improvement at the US Department of Education during the first term of President Ronald Regan, she also worked for the State Department. Her experiences during this period and her research that followed led to her book ‘The Deliberate Dumbing Down of America’. - Truth comes from authority. - Intelligence is the ability to remember and repeat. - Accurate memory and repetition are rewarded. - Conform intellectually and socially. Is it any wonder why our education system can't tell us the meaning of life or where we really come from? No that’s what religion is for, and don't worry there is a different interpretation of the big lie in most cultures, so no-ones left out, if you don't like the Christian Interpretation, try one of its many subsidiaries such as Catholicism, perhaps Budda is your buddy or maybe you'd like to give Jehovah a go? Or skip boat completely and try the teachings of Islam, it is so wonderful that in today’s society we can all accept that it is our freedom to choose our religion! What a joke that statement is! The only freedom is the freedom to choose our brand of slavery. I know that statement will go down like a lead balloon with religious people but I’m not beating around the bush, freedom of expression and thought should be welcomed and it should also be considered by religious figures and preachers that discussing opposing views with open minds would lead to the realisation of many more truths compared to simply holding onto a totally dogmatic view of the world. That goes for scientists and academics too, I’m not slamming them all or saying I’m smarter than they are but each one has their field of expertise and rarely takes the time to consider things from the perspective of any other view point, making their sciences and their studies as misguided and dogmatic as all religions. Thimerosal is a chemical compound that contains 49.6 percent mercury as a preservative. Mercury is one of the most dangerous toxins known to scientists. This is 100 times the exposure that the Environmental Protection Agency's Poison Control Center guidelines consider safe for the average-sized infant, as mercury is known to cause neurotoxicity and brain damage that mirrors the symptoms of autism. Yet medical professionals like Doctors keep advising parents to get their kids vaccinated. Yes this is the mentality we are dealing with. Again because of their own programming most parents just let them do it no questions asked, trusting the system to give their child the best possible start in life but instead causing untold damage to their kids health – and another sheep is born. These vaccinations do not boost the immune system they bypass the human immune system and therefore actually weaken it and that is exactly why so many cases of cot death can be commonly attributed to infant vaccinations. And of course the vaccinations are largely responsible for the massive increase in the number of kids with autism and other neurological problems in recent years. To quote Dr Milton J Rosenau, "Vaccinations must be looked upon as the production of an acute infectious disease." Increased intelligence = decreased creativity? Kyung Hee Kim, professor of education for the college of William and Mary in Virginia, has conducted research focused primarily on Creativity, what it is, and how it is related to society, education, and other aspects of life including intelligence. In 2005, she conducted and published a meta-analysis study synthesizing studies that were published between 1965 and 2005 regarding the relationship between creativity and intelligence. Her results show that there is a negligible relationship between the two, meaning that even without high IQ we can still be creative as long as we have the ability to master knowledge and skills in one specific domain. Originality scores also decreased since 1990, indicating that we are less able to generate unusual ideas. Originality is one of the most critical elements of creative thinking. I believe the decrease results from a climate that continues to grow less tolerant of creative expression. Everyone claims to love creativity, but very few of us understand what is really involved in creativity. Psychologically, most of us are uncomfortable with the change, uncertainty, new ideas, challenges, and risk that accompany creativity and creative behavior. In order for thinkers to present original ideas, the climate needs to be receptive, or at least not hostile, to expression and consideration of unusual and wild ideas. The proponent of an original idea starts out as a “minority of one.” A creative climate respects original ideas for the possibilities they offer, and considers how new ideas may work, instead of dismissing ideas because of reasons they won’t work. The decrease in Originality scores is an indirect measure of growing social pressures toward conformity and status quo, and increasing intolerance for new ideas. So what if education was approached with more of an open mind? The last thing Governments want is too many people thinking for themselves because people would suddenly be able to see all the corruption and lies and it would inevitably lead to an overthrow of the whole of the current system. As I said earlier this is why the education system is in place, it filters out the free thinkers at a young age, so they are constantly fighting for survival while the robot/sheep people do as told, don't think for themselves and build a wall so high that the rest of us feel too small to climb it. This is just one tiny example out of a million where we are being lied to on a world shattering scale. - We are all infinite possibility and no one is better or higher because we are all the same and are one. All in all you’re just another brick in the wall." Who wants to be just another brick in the wall? Not me.